The Fabian Society invited Nicola Smith of the TUC, Dan Corry – once a Labour government adviser – and me to address their Summer Conference ten days ago. The theme: how can Labour restore its economic credibility with the electorate? The audience was large – about 300 earnest, well-informed and assertive Fabians. The discussion was lively, with a buzz, as the session immediately following was to be a hustings for Labour leadership candidates. The budget deficit is an outcome – of decisions made by both the private and public sectors to expand or contract activity; of the levels of both public and private employment; of the amount collected in tax revenues. 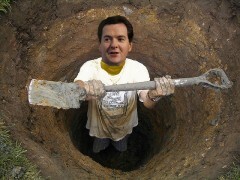 However while the Chancellor can’t “eliminate the deficit”, he can cut government expenditure and investment. Or increase government expenditure and investment. Mr Osborne knows full well, and from bitter experience that he cannot cut the deficit. As Business Insider notes: “the government’s June 2010 projections forecast that the budget would be balanced by 2014/15, the fiscal year just gone.” But that was not to be. Despite substantial cuts to government spending, “the [OBR’s] March 2015 outlook put the 2014-15 deficit at 3.3% of GDP.” That’s a lot of red ink. The Office for Budget Responsibility expects the deficit to be about £75 billion in 2015-16 in total, or £46 billion excluding investment borrowing. The deficit of 3.1% referred to by Business Insider is for the current budget, i.e. excluding investment borrowing. With investment borrowing, it amounts to around 4% of GDP. Posted in: Conservatives, Economy, Macroeconomics, Politics, Public Spending, Taxation. Why are the Right endorsing Liz Kendall? this is a valid analysis, but the big issue is the public do not understand this. how do we get people to understand that the government is not like a household – and that he already planned to eliminate the deficit and this was not achieved in 2014-15? But labour will try to explain they can, because the Tories can so labour will also. This is why you get they are all the same. Labour we will not tax or spend we will not borrow, and you get they are all the same. Labour is playing the Tories game and the Tories are better at the pack of lies. Maybe, we can remind people of Herbert Hoover who made balancing the budget a top priority after the Wall Street Crash with disastrous results. We can look at Greece today as well. The abject poverty imposed on Romania by Nicolae Ceaușescu in the 1980’s is also worth remembering for much the same reason. We will have Brown and Cameron to remind us all. The PLP haven’t bothered to counter the Tory argument because they propose the Tory solution. It’s not credible to say the Tories are wrong then offer the same Tory solution. I find myself somewhat uncomfortable with this line of argument, (that has almost become an article of faith,) although I agree completely that in a sovereign economy, (and there perhaps is the rub,) with control of it’s own currency etc the deficit as such it not necessarily the real issue. I also think as do many other people, that Osbourne’s obsession with American neolibral economic policy is simple a spurious rational, a cheap excuse if you will, for other more political social policies that will already be only too familiar from the modern American history. The history of American intervention in the third world, which is what the UK increasingly comes to resemble. Under the American financial rules, enforced by the World Bank and the IMF, governments are now only permitted to spend our money on private, (read American operated,) commercial projects and with private companies, (again read American,) and are not allowed to operate anything, (like the NHS,) independently of the, run for profit, private sector. Even our massive foreign aid budget, (both absurd and grotesque, whilst here in UK benefit claimants are being turned away by the job centre; to steal, beg or just to starve or even to die of neglect and poverty,) is simply another form of corporate welfare, (disaster capitalism,) and funds what are effectively international commercial corporations not or at least not directly, the starving and desperate children that are alway being waved in our faces to justify it. So what can we spend it on that will create a long term and sustainable recovery, creating real jobs and prosperity for the majority of people here in UK and not just massive wealth for the chosen few? Post industrial Britain, (which has sometimes been described as, the Detroit of Europe,) has no significant adds value manufacturing or services base left, most UK companies are now foreign owned and controlled, paying little or no tax and what few natural resources we still have, (shale gas for example,) are being exploited, (in the true sense,) by these same foreign owned and controlled corporations and are therefore in practice of little or no real benefit to people living the UK. So how do we earn our way in the world? J.P. I agree with much of what you say, as you may well have read on Michael Meacher’s Blogs I have indicated that in a world where we import most of our finished goods from the far east, we need a totally new perspective. That is achieved by printing money directly into the economy to fund our public services and infrastructure projects, such as council housing and local government expenditure. The private sector are sitting on mountains of money accumulated in the good times, now that we need them to spend those resources to create jobs, they refuse to as they fail to see monetary gain in doing so. That said the public sector is being shrunk and it’s assets disposed of whilst the needs for public provision increase. This catch 22 situation is as you describe a Neo-Liberal project where the benefits travel upwards and the costs are transferred to those that can least afford it. The only way out this impasse is to completely reject Neo-Liberalism and return to a planned economy based on debt free money supplied from the Bank of England and not as it is today issued as debt through the private Banks. In short nationalise the Banks, utilities and transport and spend money into the economy to pay for all the necessary requirements of people. We have the money for public expenditure and when politicians tell us we are broke, the country has run out of money, they are just lying to us. We have the money, the only limits to our economy are, human and natural resources, and in the middle of a depression as we are, there is a huge pool of labour that would welcome the opportunity to get a real wage and escape from subsistence living. Thank you, I think that real problem is domestic economic policy in the UK, indeed throughout most of the world is being largely dictated by post war American foreign and economic policy, open markets, the dollar gap, Free Trade etc, that have historically proved so divisive and so antidemocratic and we no longer have the kind of political independence to chart our own course. Greece and Venezuela have both stuck their heads over the parapet on this, as it were, and look whats happening to them as result. Mind you anyone reading the American as well as the UK newspapers as I like to, (or who has visited the US,) can only be struck and forcefully so by the current desperate state of America society; some of worst poverty that I’ve ever seen in my life, coexisting, (at least for now,) with the most obscene wealth and privilege with predicable, (historically,) consequences, but particularly for America’s poor. American financial rules, TTIP, TAFTA etc…..
Good stuff by Ann but I wonder if the Tories have one policy really – and the key one of Neo-Liberalism – CHEAP LABOUR and they are coming for the professions too! This it could be argued reduces the tax base and tax contributions, increases taxpayers subsidies for poverty pay (£11b and £1b alone to major supermarkets who make billions in profits) and of course unemployment – the industrial reserve army – increases the welfare bill, so perhaps the Neo-Liberals have painted themselves into a corner. As Streeck also argues quantitative easing (printing money) has only bought off the financial crisis for a few years and perhaps in his words – the rich and powerful haven’t a clue what to do. Marxists would probably argue that the rich and powerful also legally nick our surplus labour and what is missing from our narrative perhaps is that a Left Wing Government could try to get more of this wealth back – massive windfall taxes on big business (as Ann has argued they are sat on £800b), tax the rich & land, and a 1% EC Financial Tax (and include tax Greece in this). And more democratic public ownership with staff and communities having a say like rail, mail, some banks, pharma, some airlines, and these could break even but the publicly owned utilities could pay citizens a community dividend like the old Coop Divi – some could be public social enterprises and we could have different models but all would be democratic with communities having a say. End PFI and all major contracts to the usual private big organisations when they run out and scrap tendering and replace with dynamic community public social enterprises who give back to the community. But I do agree a Left Government should also have state-led public investment (and the private sector would pour in behind to feed the chain) but we also need to work with sister parties so we all try to meet global human need and have a global living wage (by country) etc. and we are all pursuing the same things and we could then have a global feel good factor. So perhaps there are more policy tools in the toolbox than perhaps we realise. A sister party of labour these days would mean the Tories.